← UL Beer Concentrate? WTF? This year, I’ve become a huge fan of hiking in sandals, putting a ton of mileage on my Keen Newport H2‘s. These have been my shoes of choice for weekly hikes through nearly every condition with the exception of snow. The fit of these sandals has been great and with the shielded toe, they prevent toe injuries from inadvertantly kicking a rock on the trail. From a blister perspective, these “shoes” have been better than any others that I’ve worn on the trail keeping my feet in pristine condition even on a 30+ mile day hike. Apart from blisters, the cushioning is fantastic, preventing bruising of the bottom of my foot. Having tried my sandals in myriad conditions, I sported them on an ascent up Kings Mountain on August 1st. On the climb of ~2,500 feet, the sandals performed excellent, providing good traction–even on fine dirt and sand. I didn’t fare so well in these conditions on the descent as the soles of the sandals aren’t suited, I would find, to steep descents. On several conditions on this brutal decline, my feet slid out from under me causing me (and my pack) to take an abrubt seat on the trail. This was in spite of poles! For the rest of the descent, I had to adjust how I used my poles to brace myself against further slides causing me to be very tentative on the trail. To be fair, the Newports are intended to be used for the beach and have a tread designed as such. Not intended for the mountains! Light weight (less than a pound per foot) — these weigh only 14.25 ounces per foot. I’ll note that these are slightly heavier than light trail runners, but not by much. Suitable for wearing if I need to ford streams — these are Keens, aren’t they? I purchased a pair on Thursday and will update this post after I’ve had a chance to adequately test. Will these be my new all-around hiking shoes? Time will tell . . ..
I’ve tried many different varieties of sandals in the last 1.5 years (xeroshoes, Luna sandals, etc.) 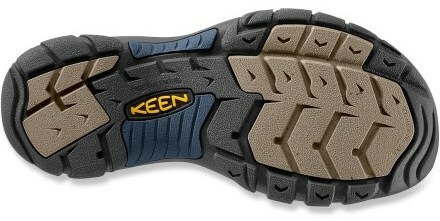 and have concluded that I still enjoy Keens the best due to the toe protection that they provide. I’ve been extremely pleased with the extremely light CNXs, hiking 24 miles in them last Sunday without any blister issues whatsoever!